Game testers, also known as beta game testers, video game testers, quality assurance testers and QA testers, test video games before the final version is released to the public. Although the games they test are nearly complete, software bugs, art glitches, and other issues that may arise during gameplay are still a threat. This means that the game tester must play the video game over and over, from start to finish, to expose any potential issues. Without game testers, games that may be filled with bugs and glitches would reach the public. These issues may make the game unplayable or playable only to a certain extent, which would result in massive returns to retailers and possible irreparable damage to the game company’s reputation. According to Vancouver, Canada-based Sokanu, game testers are needed for every platform and genre. They play games on PlayStation, Nintendo and Nintendo Wii, Xbox, and PC platforms. Action games, massively multiplayer online games (MMOGs or MMOs), role playing games, and learning games are just a few types of games testers must play and meticulously evaluate prior to release. If a bug is discovered, the game tester must compose a detailed description of what occurred and how to locate the bug or glitch. The testers’ findings are then shared with a team of programmers. These individuals will then do everything they can to fix the issues, and they will likely give the revised game to the tester to evaluate again. This process will repeat until the game is perfected. While not every game will need to be re-evaluated multiple times, many do. 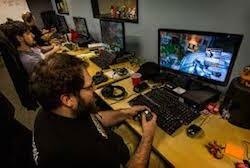 This creates a steady stream of work for game testers who often work on a contract basis and from home. * However, this does not mean that the life of a game tester is easy. In fact, game testing is a very demanding job that involves hard work, excellent verbal and communication skills, a long attention span, and a keen eye for detail. Technology skills (computer hardware and software, including applications and programming), intense focus, the ability to collaborate, cooperate and handle tedium, and critical thinking skills are also required. Advanced knowledge of games is required as well, of course, and most testers have a bachelor’s degree. Game testers must also adhere to strict deadlines, as the games release date depends on it. This means, testers are not playing for pleasure—they are playing with purpose. As such, their environment must be quiet, relaxing, and distraction-free, allowing the game tester to devote all of his attention to the game. For their time, expertise, and effort, game testers receive a handsome salary. According to the Bureau of Labor Statistics, quality assurance testers earned an average median wage of $40.98 an hour or $85,240 in 2015, and salaries can go as high as $121,230 per year for top end testers. Further, salaries have increased tremendously since 2010, when testers averaged around $49,000. Keep in mind that salaries vary based on level of education, industry, experience, and company size and location. For example, senior and top end game testers average $103,640 and $121,230 per year respectively, and testers in DC, Maryland, and Virginia average $109,810, $100,910, and $97,330 per year, respectively. "15-1199.01 - Software Quality Assurance Engineers and Testers." O-Net OnLine. National Center for O*NET Development/U.S. Department of Labor, n.d. Web. 23 May 2016. Liming, Drew, and Dennis Vilorio. "Work for Play: Careers in Video Game Development." Fall (2011): 3+. Occupational Outlook Quarterly. U.S. Bureau of Labor Statistics, 2011. Web. 23 May 2016. Taylor, Beth. "Geek Dream Job: Become a Video Game Tester." Career News. Payscale, 09 Aug. 2013. Web. 23 May 2016. "What Does a Games Tester Do?" Sokanu - Find Your Perfect Career. Sokanu, Vancouver, Canada, 2016. Web. 23 May 2016. *Some game testers do work on-site at the video game production company as part of the quality assurance team and under the direction of a lead tester.